A male osprey surveys construction of a new platform from the site of its old nest. Harwich residents brought doughnuts out for Eversouce Energy workers on Tuesday morning as the crew put up a nest platform for a pair of ospreys on Route 28. The birds arrived in the area at the end of March for nesting season but when they went to settle into their old haunt on top of a telephone pole, the nest was gone. 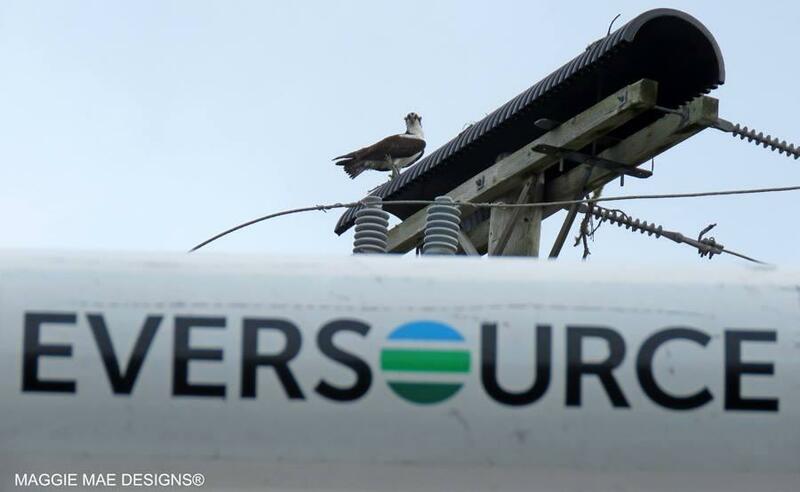 Eversource had dismantled the osprey’s nest and covered the site with a rounded plastic guard because the nest posed a safety hazard, says Eversource spokesman Reid Lamberty. Every time Eversouce takes down an osprey nest from one of their utility poles, they look for a nearby location to build an alternative nesting platform, Lamberty says. But they can’t always find a good spot. Especially with so many nesting birds. “Quite frankly, due to the increasing osprey population, it isn’t always possible for us to put up a platform every time an osprey is trying to build on equipment,” Lamberty says. This time though, the birds got lucky. After bird watcher Sally Steinmann of South Harwich complained to Eversource, the company agreed to build a nest platform off a nearby utility pole. The community is rooting for the birds to take to the platform. “Everyone wants to throw fish up there, or do something to encourage them to go to the new nest,” Steinmann says. For now, the pair’s prospects look hopeful. By Wednesday morning, the ospreys had started hauling up sticks to assemble their new home. Another sign of what we hope is the coming of Spring: the osprey. Nantucket ornithologist Vernon Laux previews the bird's seasonal return to the Cape and Islands. Ospreys have returned to the Cape and Islands. And they're finding snowy owls in their territory. Ospreys and owls intensely dislike each other. Ornithologist Vernon Laux shares his perspective on the matter in this week's Bird Report. Encounters between the two bird species are dramatic. Brad Winn, shorebird biologist for the Manomet Center for Conservation Sciences, watched an impressive display of an osprey attempting to drive off a snowy owl. He shares his photos with us. On The Point, we talk with ornithologist Rob Bierregard about his osprey research, and a new children’s book: it's the story of a young osprey tagged with a radio transmitter that allows scientists to track his first 4,000 mile solo migration journey from Martha's Vineyard to South America and back.